The notion of playing music is a familiar one, whether it relates to cueing a track to listen to on an iPod, or performing in a brass band. Yet play has other resonances for us in negotiating the way we encounter the world: children creating narratives in adventure playgrounds, corporations gamifying routine tasks to increase engagement, and five minutes of escapism on the train home through an app. This broader sense of play is also found in music, where rule-based compositions govern decisions made by the players in response to environmental cues to shape the resultant sound. We can use rules in this way to make music that parallels our experience of games and social interaction more generally. Composers working with rules use constraints to propel players through the game space of the music, with gamelike interaction becoming the material of the piece. This is play in the literal sense of a game, one that can have winners and losers, dominance and submission, tactics and strategies, individual and group purpose. In this seminar I will present theory drawn from game studies and heuristics, and consider ways to apply it to compositional processes, exploring the balance between purpose and play in indeterminate music. I will consider ways in which games might suggest approaches for harnessing specific motivations of players, facilitating ‘the process of engaging with the world and oneself through play’ (Sicart 2014: 84). I suggest such approaches might allow us to make music that has a tangible relationship with the world, where social interaction is integral to the way we experience it as participants and listeners. James Saunders is a composer who makes open form compositions that explore group behaviours and decision making. He studied at the University of Huddersfield and the Royal Northern College of Music. His music has been played at Borealis, Darmstadt, Donaueschingen , Gothenburg Arts Sounds, hcmf//, Music We’d Like to Hear, Ostrava New Music Days, Rainy Days, Roaring Hooves, Spitalfields, SPOR, Ultima, and Wittener Tage für neue Kammermusik. James has worked with ensembles and musicians including Apartment House, Arditti Quartet, asamisimasa, Rhodri Davies, EXAUDI, Nicolas Hodges, London Sinfonietta, Ensemble Modern, Neue Vocalsolisten, Plus-minus ensemble, ensemble recherche, and SWR Sinfonieorchester. He is active as a performer in the duo Parkinson Saunders with composer Tim Parkinson. 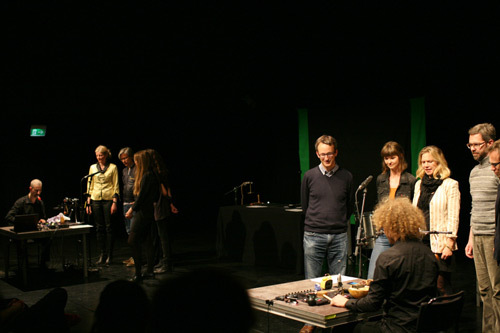 James is Professor of Music at Bath Spa University, where he directs the Open Scores Lab . He is the co-author of Word Events: Perspectives on Verbal Notation with John Lely. For more information, please visit James' website.